On December 4, 1783--two hundred and thirty years ago today--George Washington hosted a dinner for his officers in the Long Room at Fraunces Tavern. 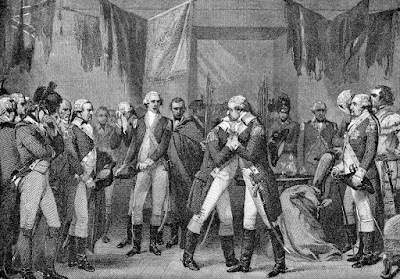 It was his final act as commander in chief of the Continental Army and, as far as he knew, also his farewell to New York City. Fraunces Tavern was one of Washington’s favorite places in the city and Samuel Fraunces, its proprietor, would eventually leave to become Washington’s personal steward. "With a heart full of love and gratitude, I now take leave of you; I most devoutly wish that your latter days may be as prosperous and happy, as your former ones have been glorious and honourable… I cannot come to each of you to take my leave, but shall be obliged to you, if each of you will come and take me by the hand." When the feast was over, a tearful Washington headed to the ferry slip, boarded a boat, and sailed to New Jersey. The next day, he began his journey south to turn in his commission and retire to Mt. Vernon. Washington's retirement, of course, turned out to be short-lived, and after presiding over the Constitutional Convention, he returned to New York in 1789 to be America's first president.